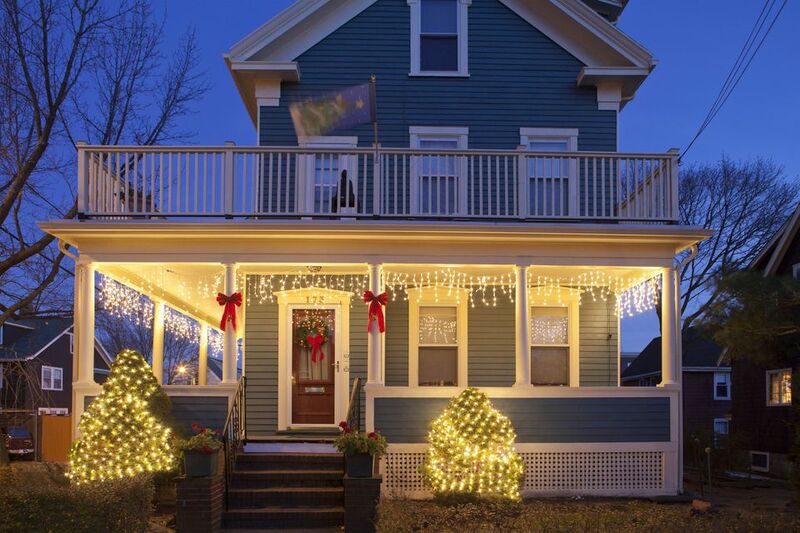 You don't have to tangle with a bazillion string lights to step-up your home's curb appeal this holiday season. Decking out your porch with natural elements and festive accents is a welcoming way to evoke the spirit of Christmas without annoying your neighbors with an excessive light show. To get you inspired, we have tons of creative ideas that are easy to replicate. Continue to 2 of 40 below. The Dollar Spot at Target is usually brimming with chic and cheap decorative goodies. These hanging copper planters that only cost $3 each are an excellent example. To create this alternative holiday wreath by Liz Marie Blog just attach the metallic canisters to a board, fill them with decorative branches, and then hang on your front door. Continue to 3 of 40 below. From the sparkly Christmas tree to pine cone garland, faux evergreens give this New England porch by At Charlotte's House a jolly vibe. The blogger who pens the site says the decorative accessories, which you can buy at any big box store, magically twinkle at night thanks to tiny LEDs that rely on a built-in timer to turn on and switch off. Continue to 4 of 40 below. Another feature we adore on this Christmas porch by At Charlotte's House is the DIY planter filled with a mix of fresh cut greenery and artificial stems. The frosting on the cake is a big red bow that adds a bold pop of seasonal color. Continue to 5 of 40 below. Gorgeous natural greenery (behold the stunning wreath!) and classic lanterns powered by LED candles are the key ingredients in this lovely holiday porch by French Country Cottage. Topping off porch urns with evergreen clippings and real tangerines is another seasonal idea worthy of stealing. Continue to 6 of 40 below. Unlit candles in birch holders combined with frosted faux greenery have a merry impact on this front entrance by Maison de Pax. Swathes of red ribbon add a dash of seasonal whimsy. Continue to 7 of 40 below. Create a traffic-stopping porch like this one done on the cheap by the duo behind The Cavender Diary. Inexpensive craft store garland and free scrap branches from the local Christmas tree lot dress up the front door. Plastic berries and a vintage cow skull pour on the drama. Continue to 8 of 40 below. After being placed in a vintage wagon cart, an artificial tree purchased at a yard sale becomes the star of this Christmas porch by While I Linger. A hand-painted sign welcomes guests with a seasonal greeting. Continue to 9 of 40 below. Here's another splendid idea from the Christmas porch by While I Linger. Fresh evergreen clippings transform a vintage fishing creel into a basket bouquet for the front door. Continue to 10 of 40 below. You don't need much to dress up a small porch for Christmas. This one by Southern Hospitality Blog features a vibrant cranberry wreath and colorful garland embellished with berries and pine cones. Because the blogger behind this entrance believes holiday cheer should start at the curb, she also adorned her streetside mailbox with festive trimmings. Continue to 11 of 40 below. This joyful stoop by Dimples and Tangles is bursting with color. Shatterproof ornaments dangle from the overhang. A couple of old sleds purchased from a garage sale get a second life as porch décor. On the door is a homemade evergreen swag festooned with brass bells. Filling lanterns with decorative Christmas baubles is another delightful idea to borrow. Continue to 12 of 40 below. Gorgeous garland gussied up with pine cones, cotton stems, and string lights get this traditional porch decorated by Deborah Silver holiday ready. The cast iron urns, which are original to the house, are bursting with seasonal greenery. Continue to 13 of 40 below. Sometimes, less is more. For instance, on this large porch decorated by Beneath My Heart, a few simple accents spells out Christmas. Berry wreaths fancify the front doors. Two small trees in galvanized buckets flank the entrance. Another five-star idea is the window box garnished with evergreen branches. Continue to 14 of 40 below. Beautify your porch overhang with this wreath chandelier idea by The Inspired Room. To make you'll need two boxwood wreaths, rope and string lights. Continue to 15 of 40 below. DIY wreaths, vintage furniture, and two artificial trees placed in old olive buckets infused this cute porch by Lolly Jane with cozy cheer. Continue to 16 of 40 below. A red door was the perfect background for three wreaths on a shimmery ribbon on this holiday stoop by Between Naps on the Porch. The natural greenery around the door is cedar, which, FYI, tends to look fuller than garland made of fresh pine. A classic Flexible Flyer sled and old ice skates add a homey touch. Continue to 17 of 40 below. Beef up scrawny artificial trees with this merry idea from The Lilypad Cottage. The smart blogger filled out the ones above with faux greenery and fake berries. Afterward, she added white ribbon and decorative candy cane balls. Continue to 18 of 40 below. This holiday display by Karen Freeland is bubbling over with rustic style thanks to weathered crates, vintage lanterns, and old wash tubs. Extra embellishments include shatterproof ornaments, bunches of branches plucked from the property, and an artificial wreath. Continue to 19 of 40 below. This cozy farm house porch decorated by Lehman Lane is overflowing with charming details that enhance its lived-in appeal. Homemade natural garland surrounds a red front door adorned with a faux poinsettia wreath. A vintage plaid thermos holds fresh-cut magnolia leaves. Two rocking chairs and a sled top off the relaxed vibe. Continue to 20 of 40 below. Cedar saplings and pine cones (both sourced from the yard) get this lovely porch by The Crowned Goat ready for Christmas. Because this home is in Florida, the little sitting area shown on the right is put to good use all year round. In winter, it becomes an outdoor tea room. Continue to 21 of 40 below. You can whip up a bohemian inspired porch like this one by Thoughts From Alice, with found objects. Here, paint turns a discarded piece of wood into a chalkboard that features a holiday message. Tree stumps from the yard flank the front entrance. Additional natural trimmings from the blogger's property include fresh cut greenery, naturally shed antlers and pine cones. Continue to 22 of 40 below. Welcome your guests with assorted seasonal greenery. 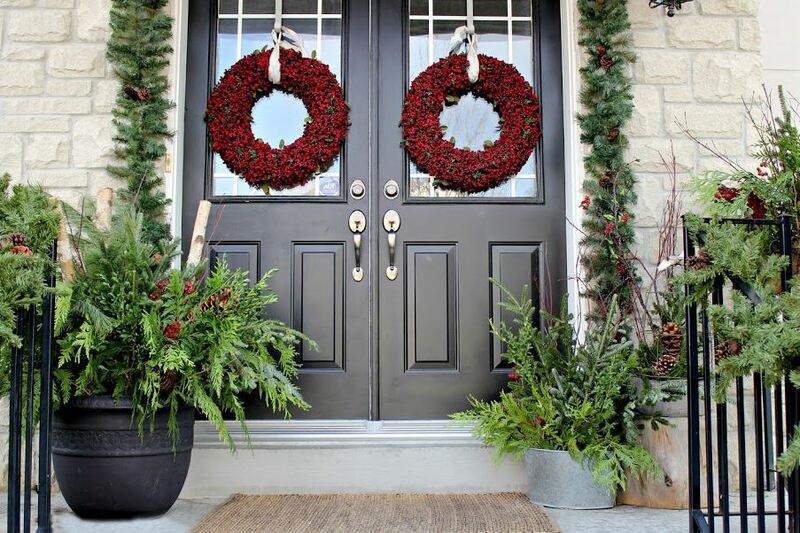 The festive stoop by Craftberry Bush features a collection of planters including inexpensive metal buckets from IKEA, overflowing with pine, cedar and boxwood branches. Here's a handy tip: To keep fresh cut stems looking fresh, spritz with water daily. Continue to 23 of 40 below. A tiny porch like this one by Cherished Bliss doesn't need much to make a merry impression. Simple, seasonal accents including traditional poinsettias and classic cedar garland make an elegant statement. Continue to 24 of 40 below. A snowstorm and several galvanized buckets packed with fresh yard clippings turned this porch decorated by Liz Marie Blog into a winter wonderland. Continue to 25 of 40 below. Reams of ribbon are the magic ingredients that spruced up this jolly display by Sweet Sorghum Living. Continue to 26 of 40 below. Personalize your porch like this example by DIY With Dawn that features several pieces of do-it-yourself décor. The little reindeer and joy sign were both made from discarded wood. The adorable white wreath was thrown together for cheap by knotting fabric scraps to a wire wreath frame. Continue to 27 of 40 below. An explosion of greenery makes this small porch by The Happy Housie super inviting. For a little contrast, the blogger added several pops of red décor. Continue to 28 of 40 below. Change can be an excellent thing. To switch things up on this Christmas porch by On Sutton Place, the blogger ditched the traditional wreath for a homemade evergreen swag embellished with a buffalo plaid scarf and sleigh bells. Another decoration that adds a heaping spoonful of holiday goodness is the enamelware tub filled with large pine cones and faux cranberries. Continue to 29 of 40 below. Don't care for red? This dazzling porch by Home Stories A to Z features festive ornaments in shades of green, aqua, silver and white. The result is a soothing yuletide entrance. Continue to 30 of 40 below. Turn your rustic junk into porch décor like this charming retro vignette by The Cozy Old Farmhouse. Continue to 31 of 40 below. An olive branch wreath gives this holiday porch by Worthing Court Blog a pinch of Mediterranean style. Instead of buying expensive garland tricked out with LED lights, the smart blogger saved a bundle by tucking string lights into pieces of budget garland. Afterward, she added craft store pine cones and artificial berries. Continue to 32 of 40 below. Nothing smells like Christmas like fresh evergreens. This porch by The Yellow Cape Cod welcomes guests with the fresh scent with natural greenery. The two newly cut trees on either side of the front door are from a local garden center. Continue to 33 of 40 below. Holiday decorating doesn't have to be complicated. This simple porch by Dandelion Patina features ice skates placed inside lanterns. Continue to 34 of 40 below. Get your old sled out of the garage. This easy Christmas porch by Fresh Farm Homestead features a group of objects that when combined capture the spirit of the holidays. Continue to 35 of 40 below. Continue to 36 of 40 below. We love bright pops of color. This adorable porch by Blue I Style Blog brings on the hues with strands of colorful decorations including cute pom-pom garland. Continue to 37 of 40 below. The holidays are the perfect time to repurpose old toys. This jolly porch by Little Vintage Nest uses a vintage red wagon to show off potted patio evergreens. Continue to 38 of 40 below. Have a silver and gold Christmas by creating a sparkly porch like this one by Randi Garrett Design. White poinsettias and inexpensive ornaments give this lovely entrance a luxurious look without breaking the bank. Continue to 39 of 40 below. A vintage Radio Flyer sled, old ice skates, Swedish ivy and a couple of small Christmas trees transform this quaint porch decorated by Cottage in the Oaks into a heartwarming entrance full of holiday nostalgia. Continue to 40 of 40 below. If you're short on time (and who isn't this time of year?) borrow this porch idea by The Sunny Side Up Blog. A simple Christmas banner and a couple of trees with faux gifts underneath make it a snap to capture the essence of the season. Nobody Does Christmas Better Than Mother Nature!